The UK's sport sponsorship market is valued at around £400 million according to UK Sport. There are different forms of sponsorships that athletes can receive, some companies choose to dress athletes head to toe in gear whereas others will provide athletes a place to train during the run up to the Olympics. Shirt and team sponsorships are the most common form, and are mainly used in sports such as football. For example Samsung Mobile sponsor Chelsea FC. Squad sponsorships are common during the Olympics, examples of this include: Aviva and the UK Athletics Team. Athlete sponsorships are when a brand chooses an athlete to sponsor, which includes providing them with branded kit and training. For example Nike sponsor Wayne Rooney. Event sponsorship is used when events such as football matches are sponsored by companies, for example the Barclays Premiership. Venue and Stadium sponsorship is when specific buildings are sponsored by companies, and example of this is the O2 Arena. Broadcast sponsorship is when sponsors cover an event that is broadcast on media platforms. For example Heineken sponsor ITV's Rugby World Cup coverage. 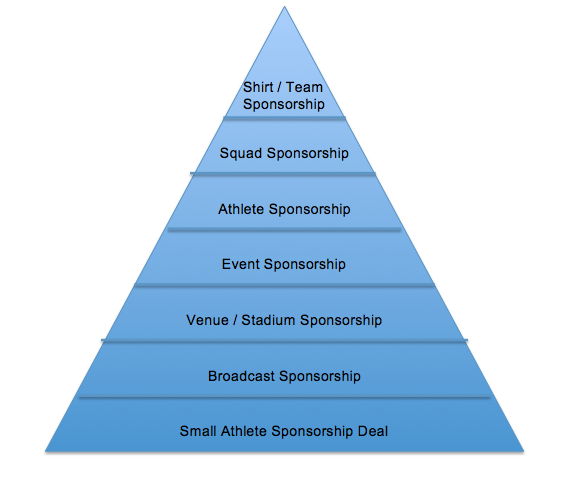 Small athlete sponsorships deals tend to help athletes on a smaller scale compared to athlete sponsorships. Deals can sometimes include places to train or kit to help them. For example a small sponsorship deal could be a hockey player receiving four free sticks a year. Nice roundup with a helpful visual aid (is that yours? Add tags and caption). See my advice about beginnings and endings (chop the first par). If you're quoting a fact, try to start with that and leave the source until after, e.g. "According to the body the UK's sport sponsorship market is valued at around £400 million."